Sony Classics has debuted an official US trailer for the acclaimed Russian drama Loveless, which has been picking up awards and accolades ever since it premiered at the Cannes Film Festival in May. If you haven't heard about this film, now is the time to catch up with it, because it will be showing up on plenty of Top 10 lists from critics this year not to mention the big awards. Loveless is about a Russian couple going through a brutal divorce, and their young son decides to run away to escape them. It's apparently not only a tough look at families and modern relationships, but also a criticism of Russia's current society. Loveless won the Jury Prize in Cannes, Best Cinematography & Best Score at the European Film Awards, Best Film at the London Film Festival, and was nominated for a Golden Globe award (it will very likely get an Oscar nomination as well). The film's cast includes Maryana Spivak, Alexei Rozin, Varvara Shmykova, Matvey Novikov, Daria Pisareva, and Yanina Hope. Check out the new trailer below for a glimpse at this searing drama. Zhenya (Maryana Spivak) and Boris (Alexei Rozin) are going through a vicious divorce that's marked by resentment, frustration and recriminations. Already embarking on new lives, each with a new partner, they are impatient to start again, to turn the page – even if it means threatening to abandon their 12-year-old son Alyosha. Until, after witnessing one of their fights, Alyosha disappears. 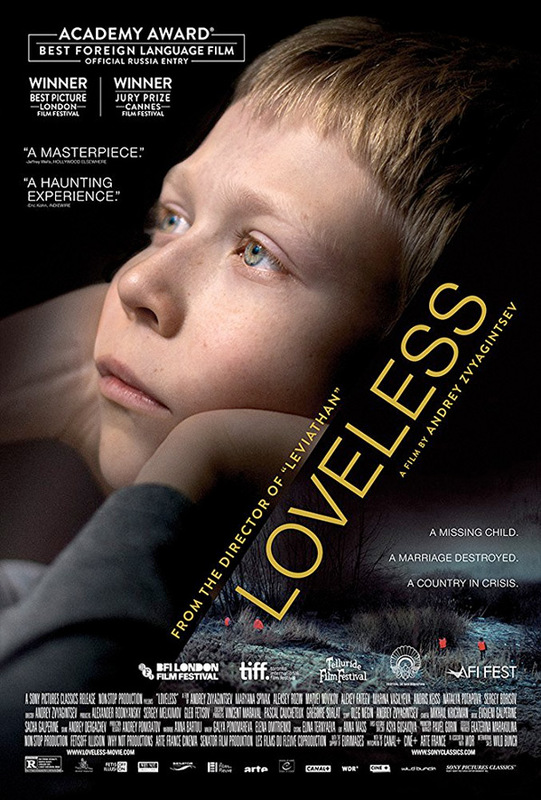 Loveless is directed by acclaimed Russian filmmaker Andrey Zvyagintsev, of the films The Return, The Banishment, Elena, and Leviathan previously. The screenplay is written by Andrey Zvyagintsev and Oleg Negin. This initially premiered at the 2017 Cannes Film Festival, where it won the Jury Prize. Sony Pictures Classics will release Zvyagintsev's Loveless in select theaters starting February 16th, 2018 early next year. Who's interested?